Rumble in the Castle! is the sixth level of Bowser's Castle in the Minion Quest: The Search for Bowser mode in Mario & Luigi: Superstar Saga + Bowser's Minions. 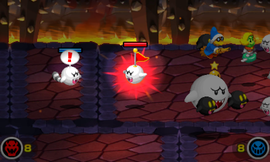 This level consists of four battles; the first one consists of five Tail Boos and two Hammer Bros in the front, as well as a Tail Boo captain. The next one consists of two Broozers and six Koopa Paratroopas in the front, as well as a Koopa Paratroopa captain. The next one consists of two Broozers and five Lakitus in the front, as well as a Big Boo captain. The last one consists of a Broozer, four Fly Guys, and two Hammer Bros in the front, as well as a Magikoopa captain. 5 Tail Boos, 2 Hammer Bros.
1 Broozer, 4 Fly Guys, 2 Hammer Bros. This page was last edited on April 19, 2019, at 17:03.